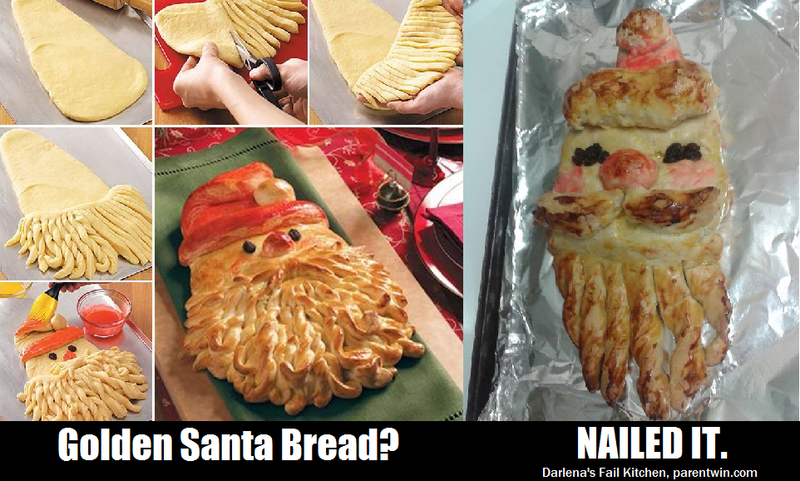 Making Golden Santa Bread was sure to be a horrible experiment gone wrong, and my lacking skills didn't disappoint. Labelled "meth Santa" by my friends, I won't be bringing him to any parties for people to nom on any time soon. To make this masterpiece of modern science, see the recipe below the video. In a large bowl, combine 2 cups flour, sugar, yeast and salt. In a small saucepan, heat milk, water and butter to 120°-130°. Add to dry ingredients; beat just until moistened. Beat in eggs until smooth. Stir in enough remaining flour to form a stiff dough. Preheat oven to 350°. Punch dough down. Turn onto a lightly floured surface; divide into two portions, one slightly larger than the other. Shape the larger portion into an elongated triangle with rounded corners for Santa's head and hat. Divide the smaller portion in half. Shape and flatten one half into a beard. Using scissors or a pizza cutter, cut into strips to within 1 in. of top. Position on Santa's face; twist and curl strips if desired. Use the remaining dough for the mustache, nose, hat pom-pom and brim. Shape a portion of dough into a mustache; flatten and cut the ends into small strips with scissors. Place above beard. Place a small ball above mustache for nose. Fold tip of hat over and add another ball for pom-pom. Roll out a narrow piece of dough to create a hat brim; position under hat. With a scissors, cut two slits for eyes; insert raisins into slits. In separate small bowls, beat egg each yolk. Add red food coloring to one yolk; carefully brush over hat, nose and cheeks. Brush plain yolk over remaining dough. Cover loosely with foil. Bake 15 minutes. Uncover; bake 10-12 minutes longer or until golden brown. Cool on a wire rack. Yield: 1 loaf. For more, check out Taste of Home (not my home, though). They're better at this than me. Awesome!! That's the best information that I've seen today. Download latest cracks of mac & pc softwares. You can get full versions of latest games, softwares, applications and many tools.